Most HTML5 game developers choose a game engine to develope their game with – it makes the process much easier since you don’t have to re-invent the wheel. The problem is, there are dozens and dozens of HTML5 games engines to choose from, many of them no longer maintained. HTML5GameEngine.com was built in an attempt to consolidate the long list of game engines down to the well-respected and maintained ones. From that smaller list, each engine is tied to important information about it: example games, popularity, user ratings, important links, license information, latest release, and more. The popularity and sample game information is grabbed from a spider that crawls the web in search of HTML5 games. 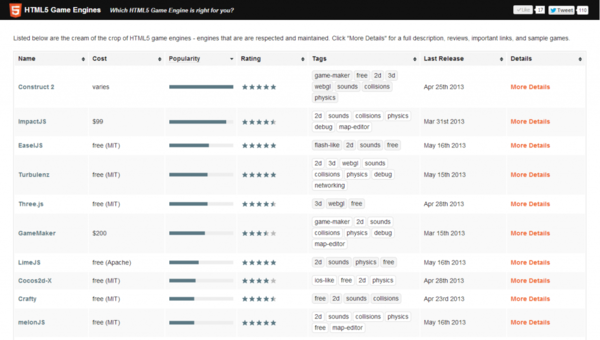 Once it grabs games, it dissects them and categorizes by the game engine used to build them. Have a look at the list of HTML5 Game Engines to find the right one for you – and when you do, be sure to rate and review it!